Crime Reporting, Part 2: What’s the Story? Picking up the sheet, then, at the point at which we had left it at the close of Part 1, another perambulation across the data yields 20 records (at least that’s what I get) whose Months Reported amount to fewer than 12, or in other words, less than a year’s worth of data. Of these, four rows offer up 0 months, meaning that, for whatever reason, there’s nothing here to report – no crimes, nothing. Leaving aside the reasons for that data dearth, I’d sort Months Reported descendingly and jam a blank row immediately above those zeroes, thus isolating them from the substantive rows. In any case the formula above considers the value in the S column, simply returning the Index Crime Total if the S value is 12 (thus signifying an entire year), or if not, multiplying the Index Crime Total by the appropriate reciprocal fraction. Thus for our Algona case, the 9-month Crime Total of 40 will be swelled by 12/9, ratcheting the total to 53.33. Of course this sort of linear, straight-line conjecture is likely imperfect, but 53.33 better surmises the Algona data than the original, but partial, 40.
and copy it down the column (keeping that caution about the blank-row-zeros in mind). 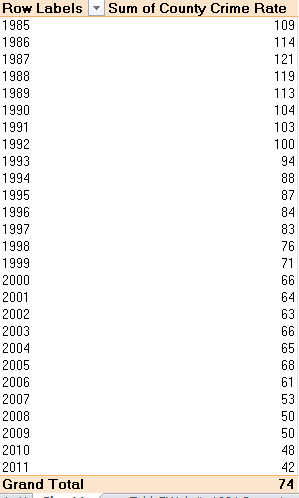 Now what about these crime rates – that is, aggregated, year-by-year rates for King County writ large? Those data aren’t in place in the worksheet yet; what are available to us right now are the County’s city-by-year rates, and true – we could orchestrate a pivot table assay of a yearly average of the rates, by simply dragging the Total Crime Rates per 1,000 Pop. (column F) into the Values area, breaking it all out by the Year field, and selecting the Summarize by > Average option. In fact, that tack is in my view an arguable strategy, but it accords disproportionate weight to smaller cities (think, for example, about simply averaging two batting averages of .200 and .300, in which one player has 10 at-bats, and the other has 600), and doesn’t hold any pride of place as a standard metric. 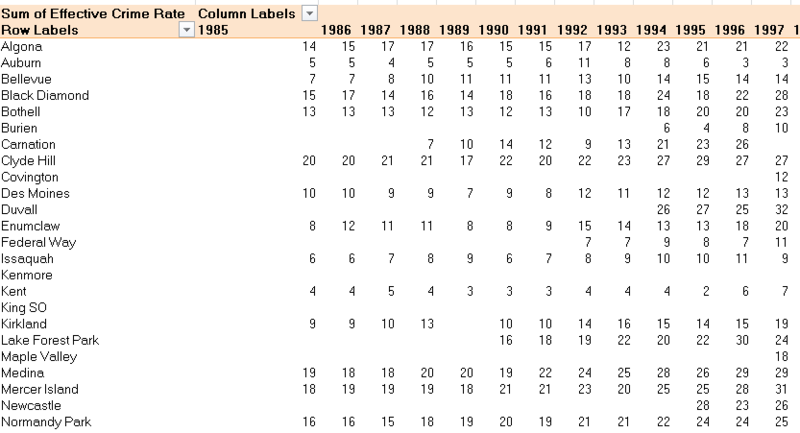 into a pivot table and see how these recombined data play out by year. And in order to put those numbers on the board we need to introduce a new term into the equation – the calculated field. I suspect that a great many pivot table devotees have yet to scavenge it from the toolbox, but the calculated field is something you’d do well to know about, and bringing it to your table isn’t a fearsome deal either. 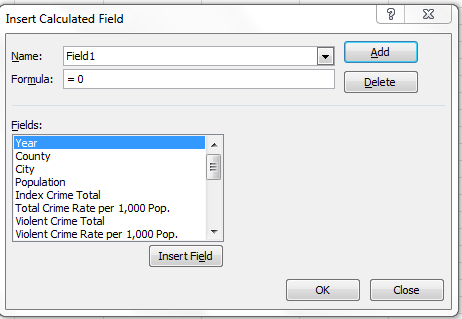 A calculated field is an on-the-fly field gleaned, or calculated, chiefly from existing fields in the pivot table’s data source, but at the same time it remains accessible only through a pivot table. Now that’s a terribly abstract first pass at a definition, but as we proceed the concept should sharpen into intelligibility. 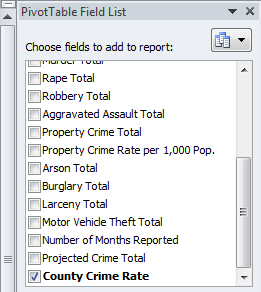 Remember that as a calculated field, County Crime Rate won’t suddenly – or ever – line up in the next available source data column; it remains pivot-table specific, just sort of out there, and confined to guest appearances in pivot tables alone. You’ll note the obvious – the extraordinary scale-down in King County crime across the 1985-2011 swath by nearly two-thirds from its 1987 peak, again to be qualified with the understanding that numerous County cities are AWOL from some of those 27 years. And to exemplify those missing city years – which, after all, could “artificially” depress or dilate the crime rates – let’s reconstruct the pivot table. 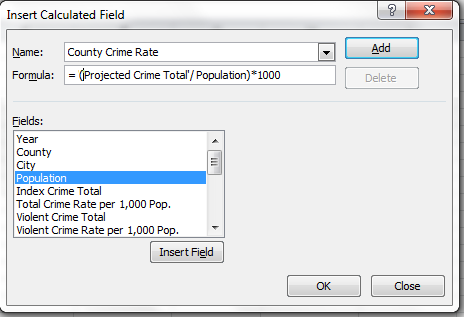 Remove our County Crime Rate calculated field (it’ll always remains on call, however), and drag the year field to the Column Labels area. Now watch this space – but before you rigidify your gaze make way for abject apology no. 2, really a reiterated one (see previous post). So far as I know, the feature we’re about to expound swept in with the 2010 release, and so 2007 users will have to sit this one out. I told you I was sorry. Had you nominated Year as the Base Field instead, you’ve have strung together an intra-city crime ranking, in which each city’s yearly rates would be compared to that selfsame city’s other years (try it). I’d say that’s pretty striking. 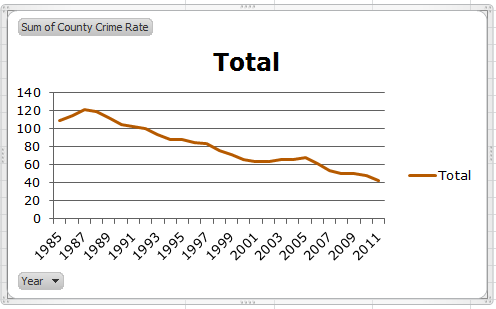 Note Tukwila’s absolute hegemony over the number 1 crime rank, holding fast across all 27 years. And if you spot-check the source data, you’ll also note the spike in the city’s population from 1989 to 1990, along with a commensurate, nearly 50% drop in crime across these adjoining years (not enough to displace it from the first position, alas). I placed that curiosity before Dr. Nathan Brown, the spreadsheet’s designer, and he ventured that some manner of territorial annexation might explain both, i.e., a city merger with nearby, more peaceable districts. But that’s something to be scrutinized, along with all sorts of other data possibilities in there (for example – how about another calculated field shaping the yearly proportions of property to violent crime?). Advising me to watch for new articles on the data, Dr. Brown allowed that Tukwila and other cities show some “interesting multi-year patterns”. Is it too nerdy to suggest that he’s right? I’ve really been enjoying your blog- it’s been a great way to learn about and gain practice with pivot tables. Quick question though- When you mentioned creating a column for Effective Crime Rate, you said to enter the following in U6: =(T6/U6)/1000 , however that created a circular reference as I was referencing U6 while using that cell to type in data, and I ended up with a column of all zeros. Is there another formula to use for Effective Crime Rate? That does make more sense, thank you. When I typed in the above formula (=(T6/D6)/1000) for Effective Crime Rate in my spreadsheet, however, I had all zeroes in my pivot table for the Sum of Effective Crime Rate because the Effective Crime Rate values were so small. The only way I could get my pivot table to contain the same values as the one pictured on your blog (with City in row labels and Year in column label) is if I used =(T6/D6)*1000. Is that the case or am I missing something? I just found your site and, as daily excel user, I enjoy how the stories you present. When I donwloaded the King County spreadsheet to apply the formula for adjusting counts when the months reported is less than 12, I believe the * is misplaced in the second half of the formula (Excel “complained” that my syntax was incorrect; when I rewrote formula as …E6*(12/S6)), Excel was pleased. That’s how I have it on my spreadsheet; I just didn’t transcribe it properly in the post.